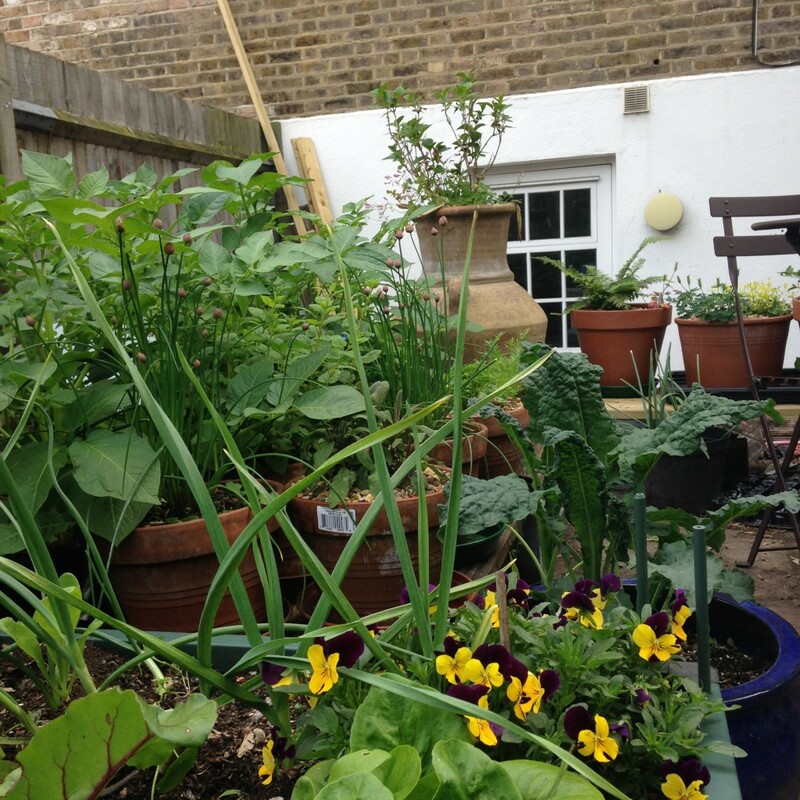 Inspired by my friend Wendy, this was the first year I achieved something that resembled a garden rather than a vegetable plot with a handful of pollinator-friendly flowers thrown in. Although far from perfect, I managed a succession of flowers and now as the garden is settling into the winter, my mind turns to next year and an even more abundant display. Year-round colour involves planning, and a mix of propagating, succession planting and overwintering, all of which pose distinct challenges in a tiny garden without greenhouse, shed or seedbed. With gardening it can take seasons to find solutions but that said, here are some of the approaches I’m using to extend the colour in my tiny garden. Annuals* are an easy and cheap way to get into flower growing. Although they will always have a place in my garden as they’re an inexpensive way of ringing the changes, introduce biennials and perennials as they can help extend the seasons. Biennials* need to be sown in early summer, just as the colour in the garden lulls you into a false sense of abundance. 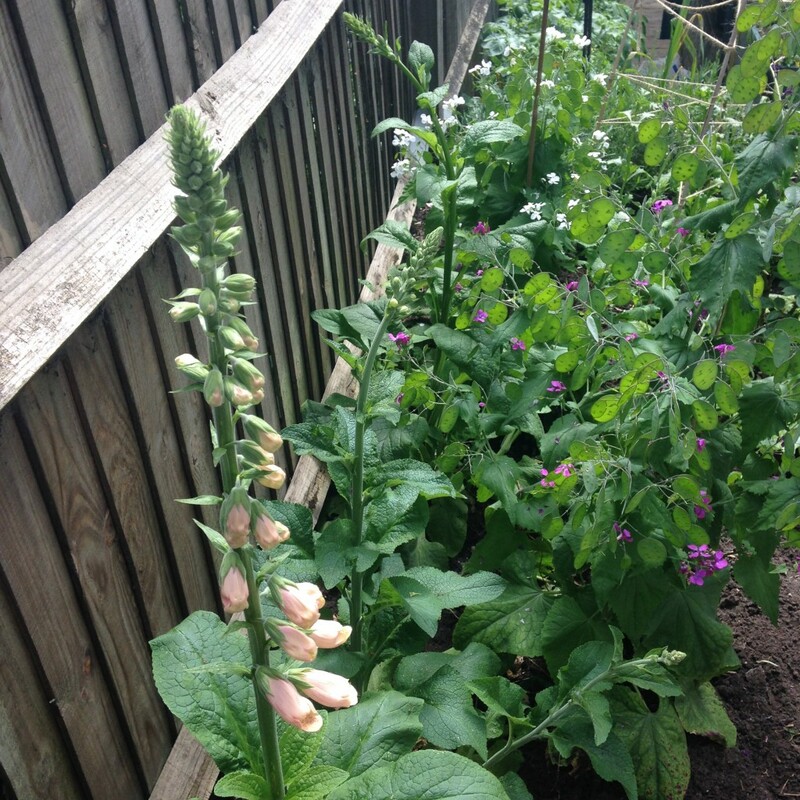 However, sowing wallflowers or foxgloves in June will mean shots of colour and beauty in late spring to bridge the gap between winter bulbs and summer annuals. As space is at a premium, I start seeds off indoors and prick them out into pots that I store on the steps to the front door. Come early autumn I dig out any faded annuals and plant out the biennials so they can put on growth before the first frosts. 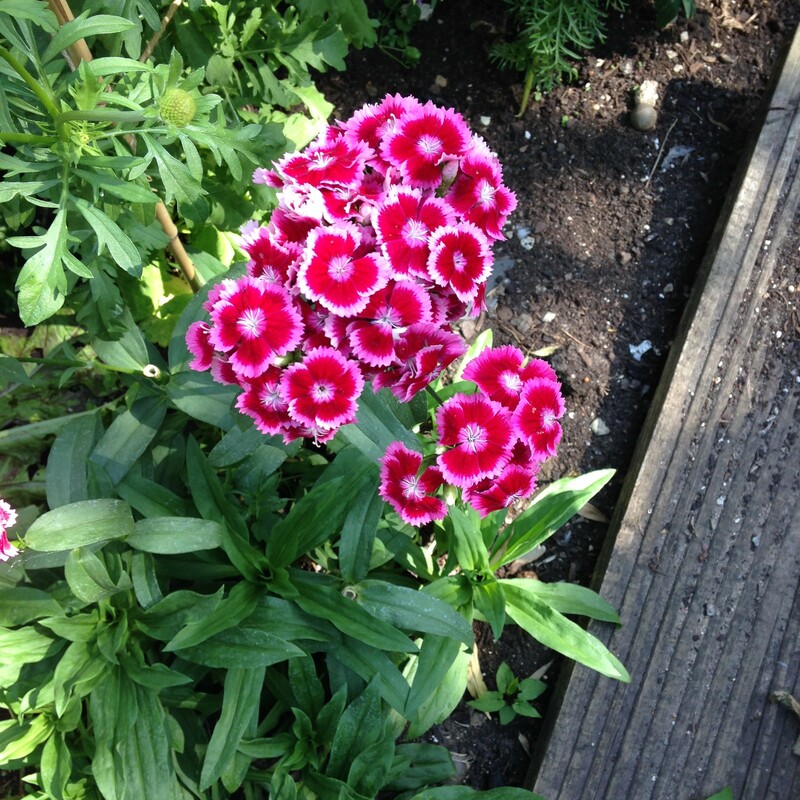 Perennials* not only provide a backbone to a garden but if chosen carefully can also extend the colour season. If space were no object I’d invest in flowering shrubs and cornus but as it is, I have to “make do” with perennial flowers that allow me to make the most of my limited space. 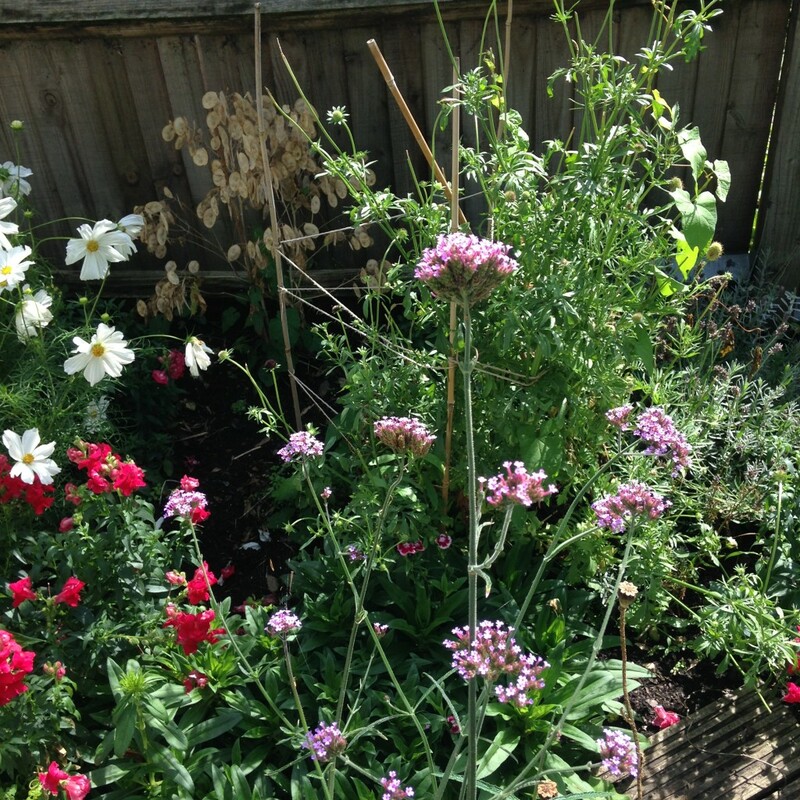 One of the super stars this year has been my Verbena bonariensis. This tall plant with its small purple flowers is a graceful addition that pollinators love and keeps going till the first frosts. Its elegant rising stems means I can mix it with other plants for an airy display, like Cosmos purity for a soothing effect or helenium for a warm display. I love roses but really have to ration myself in my tiny garden. Also, as much as I long for old variety roses like the Damask rose, common sense dictates hybrid tea roses as they repeat flower. This winter I’ll treat** myself to a climbing one so I can grow it against the back wall and trellis and enjoy the repeat flowering for years to come. A practical solution when space is at a premium! 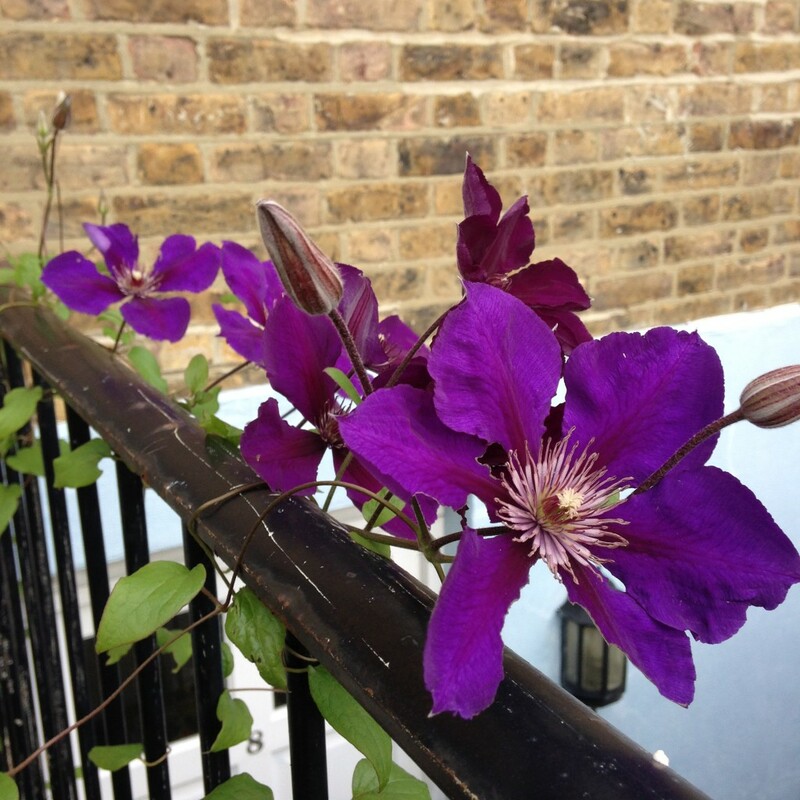 Clematis is another delightful option for small gardens as it makes use of verticals. Also, as there are many varieties of clematis with different flowering times and preferences, including shade loving ones, it is usually possible to find one to suit your tiny garden. I have added a white one that will grow on a shady wall as I was so beguiled by the majestic purple one that welcomed me home all summer. A joy to return home too! Bulbs and corms are a super way of introducing a succession of colour in the winter months but buying new ones every year is expensive. With some planning and patience though it’s possible to build up a march of colour. By all means buy tulip bulbs for a display that will make your heart sing (provided you protect them from hungry squirrels! ), but order a packet of daffodil or crocus bulbs too, or maybe some anemone corms, as these will come back stronger year on year. I started with two bags of narcissi five years ago, which I planted in our front ‘garden’***. After flowering they stay in the ground, die back and produce more bulbs so each year the display of daffodils is more impressive. After a few years the clumps were big enough to divide and now I have enough bulbs for a few pots of narcissi in the back garden too. Once they have flowered, I move the pots against the shady back wall to make use of the sunnier spot for the next container of gorgeousness. I have started the same process with crocuses, planting them in the same pots as my clematises and in a layer above my tulips. To really extend the season I shall experiment with a couple of dahlias next year. These come as a tuber, an unprepossessing mass that looks like knobbly fingers. They aren’t cheap but handle them with care and you can stretch the season with stunning colours for years to come. As dahlias are tender, they can’t be planted out till the last frosts have passed (probably late May here) but once they come into bloom over the summer, with regular deadheading, they will keep going till late autumn. The prospect of burnished plums and oranges as the days grow short and chilly has convinced me to give them a spot in my garden and find a place in my study to overwinter the “ugly fingers”. And like narcissi, with time, I should get more plants from a single tuber. Picking plants with interesting flower or seed heads means the garden retains interest and different shades even after blooms have faded. Shortly after we moved in, I planted two hydrangeas in planters in a shady corner of the garden. Each year I love watching them change from striking magenta flowers to a faded mop of burnished old rose and then a slightly tatty bunch of aged paper like flowers. Similarly, the translucent silver discs of honesty catch the winter sun and add a glint of interest to an otherwise subdued garden. Finally, little unassuming flowers are great for adding dashes of colour. Last autumn I planted winter-flowering violas amongst my lettuces as decoy plants. They did the trick keeping the slugs off my winter lettuces but most of all they brought a shot of colour to the garden in darker months and a smile to my face. I love how some varieties look like grumpy old men with scrunched up eyebrows! In the spring I added some old fashioned pinks for their heady scent. With deadheading this unassuming perennial keeps going, adding a delicate crinkle of white or pink to scrappy corners of my garden. At this time of year I crave colour. This is the first of a series of posts about and inspired by colour. ** Winter is a good time to invest in roses as you can buy them as bare root roses, i.e. a rose that is dormant and is bought looking like a root with about a foot of stem. It is cheaper to buy them like this than as a potted plant in spring. *** Garden is probably an exaggeration as it’s just a strip of soil of about 2 ft wide and 8 ft long.